These images of Saturn and Titan probably provided astronomers and scientists with a lot of valuable information but regardless, they are also very nice to look at (for everyone). 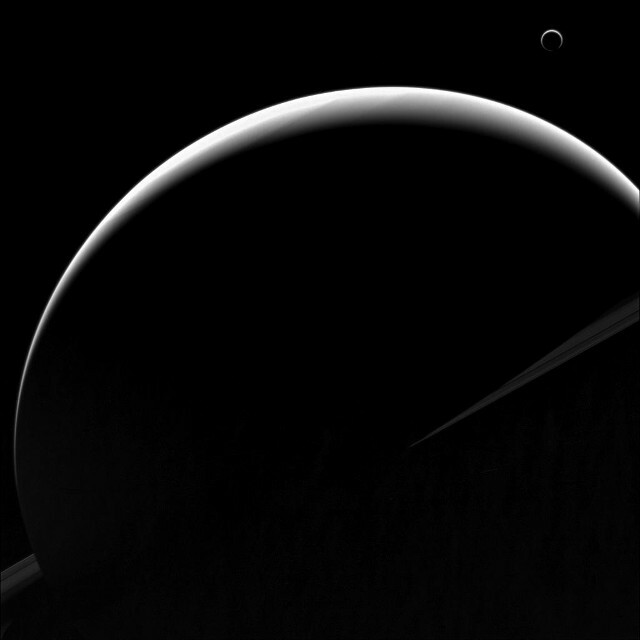 This crescent phase of Saturn and its moon Titan was captured by the Cassini orbiter’s on board camera systems, taken while Cassini was looking towards the sunlit side of Saturn’s rings from just above the ring plane. The spacecraft was approximately 1.7 million kilometers from Saturn when it took this violet light image in 2013. NASA’s Cassini orbiter has taken many wonderful pictures of Saturn and its moons with this snapshot of Titan being one of them. 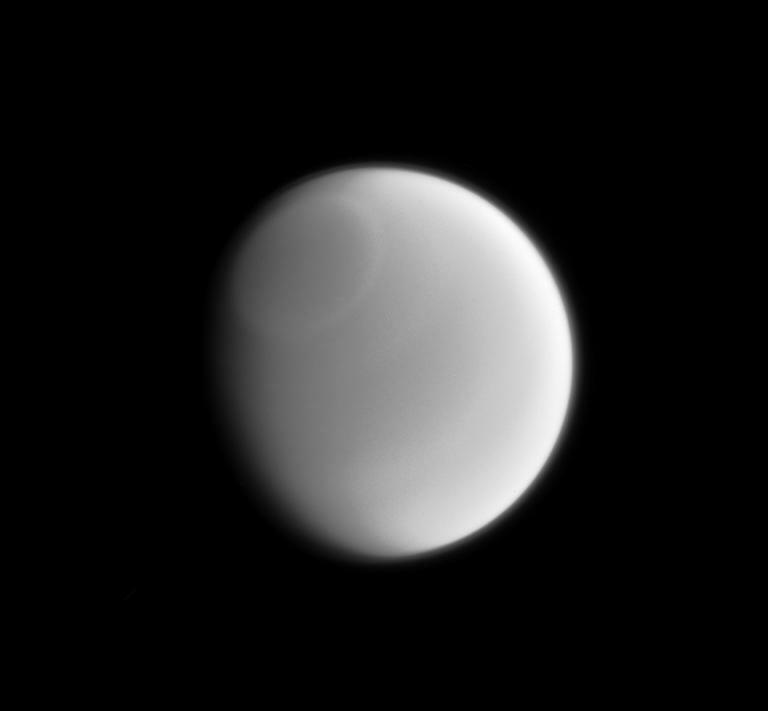 The near-infrared, color mosaic of the giant planet sized Titan was taken by an interesting camera on the orbiter called the Visual and Infrared Mapping Spectrometer (VIMS). This camera takes pictures in 352 colours at the same time with wavelengths in the 300-5100 nano meter range, which is greater than what can be discerned by the human eye. 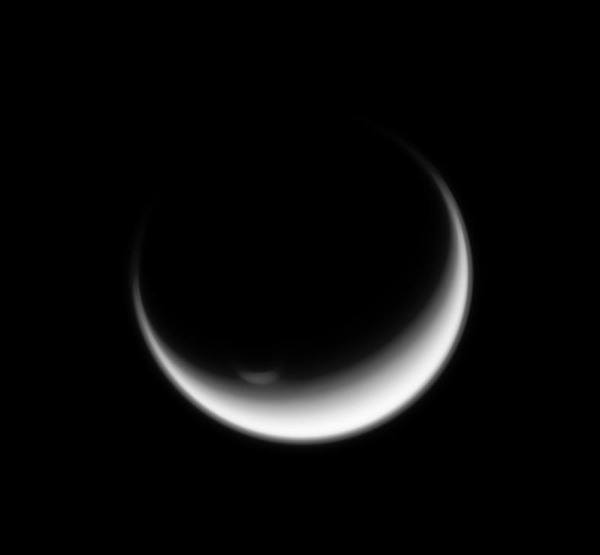 This image shows the sun glinting off of Titan’s northern polar seas. This subtle and smoothed out infrared image of Saturn’s largest moon, Titan was taken by Cassini spacecraft’s narrow-angle camera and shows us a band around the Titan’s north pole. The mind boggling aspect of this image is that it was taken while Cassini was approximately 1.5 million miles (2.4 million kilometers) from Titan, using a spectral filter which preferentially allows through wavelengths of near-infrared light centered at 889 nanometers. 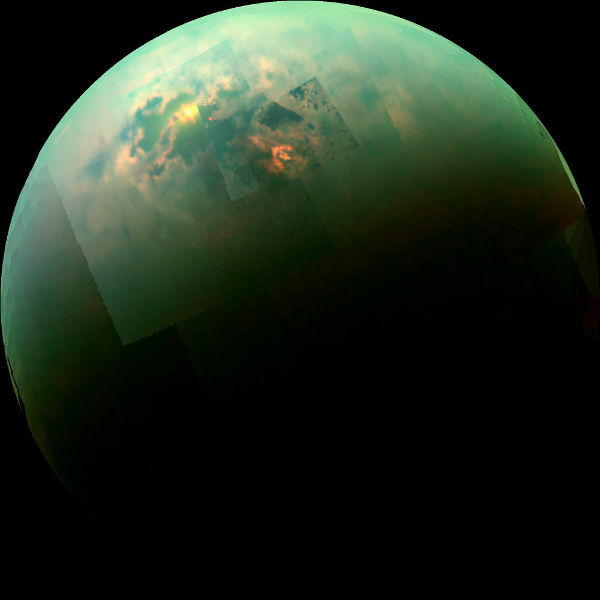 Titan is one of the 62 moons of planet Saturn, and is considered a very “planet like moon” being that it is the only natural satellite with a naturally dense atmosphere consisting mostly of nitrogen gas. The Cassini orbiter took this picture of Titan’s polar vortex from a distance of about 134,000 miles. The southern pole of Titan is in winter season but the Sun is still able to illuminate Titan’s polar vortex, while everything else is in shadow. An early (August 26, 1979) image of Saturn and one of its moons, Titan (top left of the picture), taken by NASA’s venerable Pioneer 11 space probe.